Liao, WT, et al (2013) MicroRNA‐30b functions as a tumour suppressor in human colorectal cancer by targeting KRAS, PIK3CD and BCL2. The Journal of Pathology, DOI: 10.1002/path.4309. [miR-30b mimics, negative control and anti-miR-30b inhibitors]. Sun, X. et al (2013) HspB1 silences translation of PDZ-RhoGEF by enhancing miR-20a and miR-128 expression to promote neurite extension. Molecular and Cellular Neuroscience, Volume 57, November 2013, Pages 111–119. 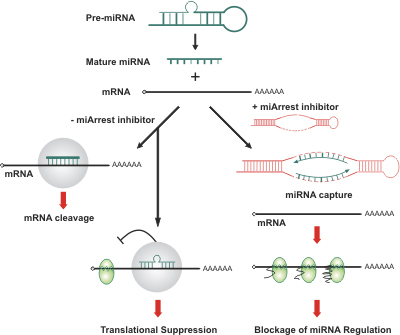 [miArrest™ MicroRNA Inhibitors for miR-20a, miR-128 and miR-132]. Dimri, M. et al (2013) microRNA-141 regulates BMI1 expression and induces senescence in human diploid fibroblasts. Cell Cycle, Volume 12, Issue 22, Pages 3537-3546. [pEZX-AM03 expressing hsa-miR-141 inhibitor, pEZX-MR03 expressing either hsa-miR-141 or hsa-miR-200c]. Liao, WT. et al (2013) MicroRNA-224 promotes cell proliferation and tumor growth in human colorectal cancer by repressing PHLPP1 and PHLPP2. Clinical Cancer Research, Clin Cancer Res September 1, 2013 19; 4662. [miR-224 mimics, negative control, and anti-miR-224 inhibitors]. Nguyen, T. et al (2013) MiR-24 Promotes the Survival of Hematopoietic Cells. PloS one, 8(1): e55406. DOI:10.1371/journal.pone.0055406. [miR-24 miRNA inhibitor]. Sharma, S. et al. 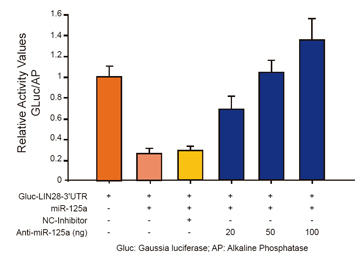 (2012) Repression of miR-142 by p300 and MAPK is required for survival signalling via gp130 during adaptive hypertrophy. EMBO Molecular Medicine, Volume 4, Issue 7, pages 617–632, July 2012. [miR142-5p inhibitor]. Kong, Y. et al. (2012) The Deoxycholic Acid Targets miRNA-dependent CAC1 Gene Expression in Multidrug Resistance of Human Colorectal Cancer. The International Journal of Biochemistry & Cell Biology, Available online 10 August 2012. [miR-199a-5p]. Samakoglu, S. et al. (2012) Preclinical Rationale for Combining an EGFR Antibody with Cis... Cancer Genomics and Proteomics March-April 2012 vol. 9 no. 2 77-92. [hsa-miRNA-29b synthetic inhibitor]. Izumiya, M. et al. (2011) Systematic exploration of cancer-associated microRNA through functional screening assays. Cancer Science Volume 102, Issue 9. [miRNA inhibitor and precursor miRNA]. This entry was posted in miRNA完整解决方案, 产品, 克隆库 and tagged miRNA抑制剂克隆. Bookmark the permalink.